Modern interpersonal psychology is now at a point where recent advances need to be organized so that researchers, practitioners, and students can understand what is new, different, and state-of-the art. This field-defining volume examines the history of interpersonal psychology and explores influential theories of normal-abnormal behaviors, widely-used assessment measures, recent methodological advances, and current interpersonal strategies for changing problematic behaviors. 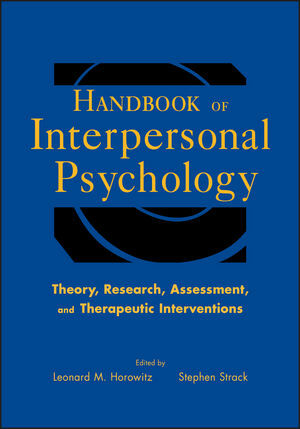 Featuring original contributions from field luminaries including Aaron Pincus, John Clarkin, David Buss, Louis Castonguay, and Theodore Millon, this cutting-edge volume will appeal to academicians, professionals, and students interested in the study of normal and abnormal interpersonal behavior. Leonard M. Horowitz, Ph.D., is professor of psychology at Stanford University. With Hans Strupp and Michael Lambert, he directed an APA task force on creating a core battery of standardized tests for evaluating the outcome of psychotherapy, resulting in the book Measuring Patient Changes in Mood, Anxiety, and Personality Disorders: Toward a Core Battery (APA, 1997). His test, the Inventory of Interpersonal Problems, was published in 2000 by the Psychological Corporation, and his book, Interpersonal Foundations of Psychopathology in 2004. He was president of the Society for Psychotherapy Research from 1992 to 1993 and president of the Society for Interpersonal Theory and Research from 1999 to 2000. Stephen Strack, Ph.D., is a staff psychologist at the VA Ambulatory Care Center in Los Angeles, CA, and holds faculty appointments at Alliant International University, Los Angeles, and Fuller Graduate School of Psychology in Pasadena, CA. He is the author or editor of nine books and test manuals, including Differentiating Normal and Abnormal Personality (2nd ed., 2006) and the Handbook of Personology and Psychopathology (2005). He has also published over 50 chapters and journal articles. An internationally-recognized expert in personality theory and assessment, he is on the editorial board of four scientific journals and is a Fellow of the APA and Society for Personality Assessment.